Spring is here! When the weather warms up we all have the desire to go outside and enjoy the day. Children especially love to go outside and run around. Suppose you learned that spending less time in the classroom and more time on the playground would result in kids getting better grades and better test scores? Probably the most important and exciting discoveries of the past few decades. Movement and exercise promote all kinds of learning and, in fact, are vital for learning. Children running around a playground are not just taking a break from class. They are not just reducing their level of stress. Physical activity is promotes all the brain functions which are needed for learning to occur. Carla Hannaford in her important 1995 book Smart Moves: Why Learning is Not All in Your Head cites a study in which 500 Canadian children who spent an extra hour or more each day in gym class, performed notably better on exams than less active children. This book is as important today as it was when it was published almost 20 years ago. John Ratey in Spark the Revolutionary New Science of Exercise and the Brain (2008) described studies by the California Dept of Education showing that students with higher fitness levels also had higher test scores. In fact, a panel of researchers doing a review of over 850 studies, concluded that exercise has a positive effect on memory, concentration and behavior. They recommended that all children participate in at least one hour of physical activity each day. On one level, it is easy to see why exercise would help the brain to function better. Exercise sends more blood, oxygen and nutrients to the brain, which would naturally help it to work. But it goes beyond this. It has been learned that exercise causes the brain to produce BDNF, a neurotransmitter that is necessary for learning to occur. Without exercise the brain and body become sluggish and are unable to do their best. This is even more important for children who are having trouble in school. Movement and exercise will help their brains to function at peak capacity. A reasonable amount of exercise every day is beneficial for children to learn in school. Daily gym and frequent breaks to allow them to move and stretch are important. 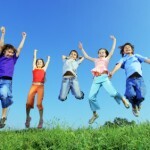 After school, before sitting to do homework (or watch TV) it is best to let them out to get a healthy dose of exercise. In the springtime this is very easy to do. Usually this is what they want to do and this is because, intuitively, their bodies know what they need. This goes for adults, too, by the way. Daily exercise which you can enjoy, even just a walk around the block, is crucial, especially for those of us with sedentary occupations. A reasonable amount of regular exercise is a win-win solution for everyone. Ratey, John J., Spark The Revolutionary Science of Exercise and the Brain (2008) New York, NY: Little, Brown & Co.